Everyone loves that salon-fresh feeling you get when you’ve just had a professional blowdry. It feels bouncier, looks shiner and is static-free! Then you wash your hair. Blowdrying is one of those things that you probably do fairly often, yet know in the back of your mind you’re doing wrong. Yes, blasting your hair indiscriminately until it feels sort of dry will do the job, but it means you’re not getting the most out of your blowout. Aside from kidnapping your stylist, there are a few things you can do to achieve a better blowdry at home – without having to spend an extra hour in front of the mirror. So next time you reach for the hair dryer, remember these simple blow drying tips and tricks for a professional-looking finish! They say a good workman never blames his tools, but sometimes that just doesn’t follow suit. If you really want a salon-quality blowout, you need to invest in a decent hair dryer and brushes. 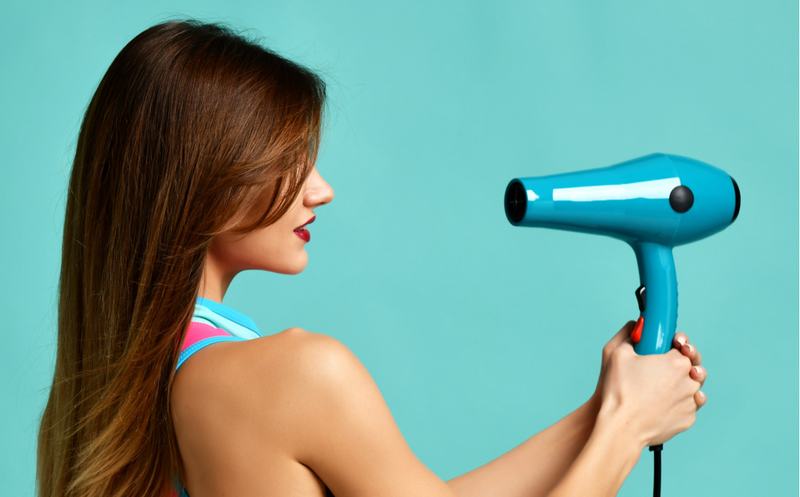 Cheap hair dryers can actually affect the condition of your hair, since they don’t come with the sorts of features – like multiple heat settings and ionic air technology – that are designed to prevent heat damage. Ionic hair dryers are especially good at doing this; the technology that they use breaks down water molecules quicker, which makes your hair dry faster. The less that your hair is exposed to the heat, the healthier it’ll be. Ionic air technology also reduces frizz and creates shine, so you’ll end up with a smoother finish. And if you want to perfect your technique, you’ll need to make sure that your hair dryer is comfortable to hold too. Secondly, you’ll need a brush that’s best suited to your hair type and cut. Choose a good quality round brush that’s the right size; the longer your hair is, the bigger your round brush should be. If you’ve got short hair, a radial brush that’s 20-35mm in diameter will suffice; for medium-length hair, the ideal brush size is between 35-45mm; those with long hair should use larger brushes than this – anywhere between 50-70mm works best. You should also think about the material of your brush bristles. If you’ve got straight hair but want to create movement with your blowout, choose a ceramic brush. And for smoothness, a boar bristle brush works well – especially if your hair is coarse. It’ll provide the right amount of tension to achieve smooth, frizz-free results. Brushes with ceramic-coated barrels – which heat up – can reduce heat damage, since they allow the hair to dry more quickly. Most people are guilty of leaving their hair in a towel for quite some time after they’ve gotten out of the shower. But cotton towels cause friction, which can lead to breakage. Rubbing your hair with a cotton towel can cause frizz; wearing it wrapped on your head for too long can flatten your roots. Instead, use a microfibre towel, but only leave your hair wrapped in it for about 10 minutes after you’ve washed it. Better still, leave your hair to partially air-dry before blow drying it. Taking a hair dryer to sopping wet hair can be damaging, so wait until it’s at least 65% dry before you start blow drying it. Brushing wet hair can cause breakage too, since it’s weaker when wet. Start blow drying your hair using only your fingers; once it’s dried off a little, you can use your brush to shape and style it. Depending on your hair type and the desired finish, you can be flexible with this. Fine-to-medium hair can air dry a little longer (up to about 80% dryness). If you’ve got thick, curly hair and are looking to achieve a straighter style, you should start blow drying it once it’s about 50% dry; you have a better chance of getting the look you want that way. To enhance your natural curls, you should apply a curl defining serum to your hair whilst it’s very wet, then gently wrap in a microfibre towel until your hair stops dripping. You can then start to blow dry it. Whenever you use hot styling tools, you should apply a heat protection spray; it’ll prevent breakage, which will ultimately make your blowout last longer. Heat protectants contain polymers that create a barrier on the surface of the hair. Today, most styling products offer heat protection too, so it’s worth shopping around to find one that’s got multiple benefits. When using a hair product – whether it’s a heat protectant, a frizz-fighting serum or a thickening spray – many people just apply it to the top of their head. This can weigh down the hair and make your roots appear greasy; more importantly though, your product isn’t going to work as well as it should. To make sure that it’s equally distributed, part and section your hair, and apply the product from the mid-shaft to the tips (you can comb it through or just use your fingers). If you’re after va-va-voom volume, always start blowdrying your hair at the roots (unless you have a fringe, in which case, blowdry that first). Brushes are usually too big to get close enough to your roots, so use your hands to comb them up and blow dry. You can also flip your head over and massage your roots whilst blasting them with the hair dryer; you basically just want them to sit up and off of your head. To style your hair, put your barrel brush in at the roots and roll it down to the ends. Once your roots and hairline are dry, you can work on the tips; roll them on the brush to finish drying. If you want to add more volume at the crown, you can use rollers. Pin in a few larger rollers whilst the hair is still warm from the hair dryer, and set them close to your head. Let your hair cool naturally or blast it with the cold air from the hair dryer if you’re short of time. To achieve a salon-quality blowout, you’ll need to section your hair. Using sectioning clips, separate the hair into three or four rows (depending on how much hair you’ve got). Using your barrel brush, roll the hair from root to tip. For a glossy finish, it’s important to keep your hair tautly wrapped around the brush as you pull it through. Ah, the humble hair dryer nozzle. Though it might not look like much, it’s actually a pretty important design feature. Without it, your hair dryer just applies heat everywhere; add a nozzle, and the heat is concentrated on the cuticle, smoothing it out for a shinier finish. Concentrated heat is less damaging too, since you’re less likely to overdry sections of the hair. Keep the nozzle pointing down the hair shaft, and make sure it’s at least 3 inches away from your hair at all times. If you’ve got curly hair, a diffuser will minimise frizz, define your curls and give them a little lift. These dome-shaped, spiked attachments can be bought separately, and usually work with most hair dryers. Simply attach it to your hair dryer, switch on the lowest setting and lift your hair into the diffuser. Cup it around your hair, continuing this way until it’s completely dry. Don’t brush out your curls (you’ll undo all your hard work! ); just shape them with your fingers if necessary. For a longer-lasting blowdry, let your hair ‘set’ or cool down on the brush before moving onto the next section. And once you’ve finished blowdrying your hair, blast it with a stream of cool air from your hair dryer; this gives hair more elasticity. Mist over your hair with a lightweight setting spray to finish. Avoid using heavy hairsprays as these can leave your hair feeling unclean, which only means you’ll have to blowdry it again the next day.